If you are looking for a perfect gift for any occasion, look no further! The Founding of Naples, written by Ron Jamro & Gerald L. Lanterman, and Published by the Friends of Collier County Museum is an informative 84 page book including over 50 historic photographs. A glittering, white sandy beach on the southwest coast of Florida may seem an unlikely birthplace for a history book. Yet, here in Naples, a determined effort was made to clarify and set straight the historical record of a city shrouded by more than a century of well-intentioned misteaching. Naples rightfully boasts its sunny climate and choice location but frequently forgets its colorful past. Thus, the tired and traditional tale of its founding has endured the passage of time with a prominence and durability far beyond its true worth. Until now! 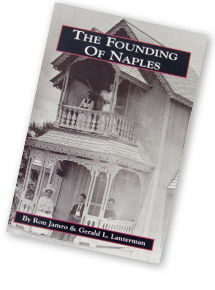 To purchase The Founding Of Naples please call the Collier County Museum at 239.774.8476.